Going far beyond competing patient survey systems. Widely used, trusted, cost-effective CG-CAHPS Solution. Patent pending process is proven to get outstanding results. MedicalGPS Empowers Healthcare Providers to Benefit from and Maximize Patient Retention and Loyalty. M3-Patient Experience® helps our clients understand the patient's perspective, identifying areas for service improvement and fostering patient loyalty. M3-Advoate™ (patent pending) allows the patient-provider relationship to flourish, resulting in tangible benefits to both the patient and the practice. By leveraging the power of the internet MedicalGPS clients enjoy continuous open-lines of communication with up to 100% of the practice's patients; resulting in increased patient satisfaction, reduced malpractice risks, and overall improved CG-CAHPS scores. With MedicalGPS, Patient Satisfaction is Only the Beginning. By utilizing the extensive experience of our personnel to implement consumer-focused, practical solutions, tailored to the unique needs of every client, MedicalGPS provides actionable, near real-time information to the fingertips of Healthcare Providers, Administrators and Staff, equipping them to make better-informed decisions about day-to-day operations. We understand the challenges our clients face daily and offer hands on experience, working side-by-side with support staff, physicians, and administration; sharing our own healthcare operations experience. MedicalGPS' focus is on providing services to all healthcare verticals, including but not limited to; physician practice operations, ambulatory surgery centers, hospital in-patient care, emergency departments, hospice care, hemodialysis facilities, diagnostic centers, ancillary services, telemedicine, and wellness programs. 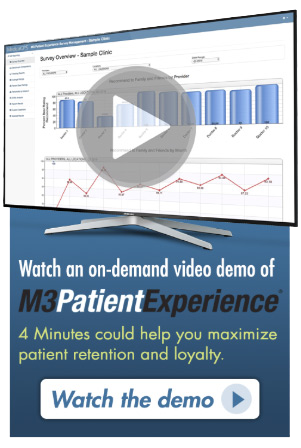 M3 Patient Experience is MedicalGPS' continuous patient feedback system that enables healthcare providers to foster patient loyalty, reduce malpractice risks, perform service recovery, and align patient expectations with patient experience.